Doctors prescribe opioids (such as methadone, oxycodone and hydrocodone) to treat moderate-to-severe pain often following injury or surgery. Prescriptions for non-standard uses such as back pain and osteoarthritis have increased dramatically in recent years. Sales of prescription opioids have quadrupled since 1999. Nearly a quarter billion opioid prescriptions were written in 2013. The Food and Drug Administration has proposed changes to the way it educates healthcare providers on treating pain, including the use of chiropractic care and other non-drug solutions. Just yesterday, President Trump signed legislation reaffirming the FDA’s changes. 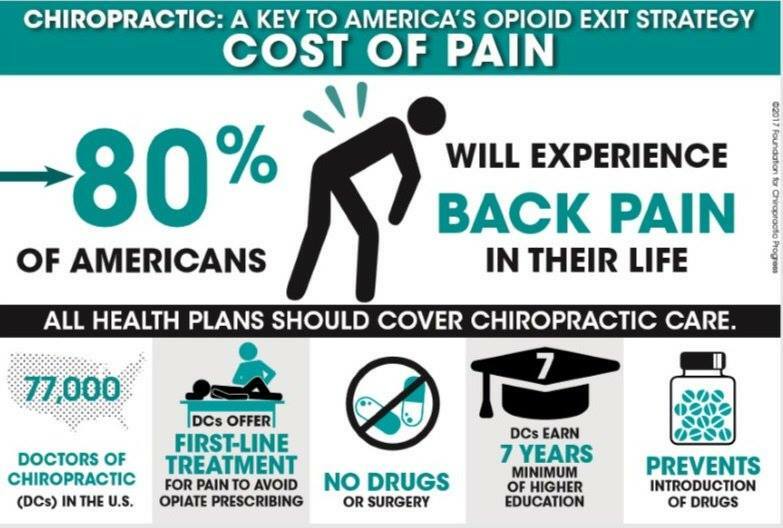 The American College of Physicians announced earlier this year that it would recommend non-surgical approaches such as chiropractic as the first option to treat lower back pain. Chiropractic treatment takes a broader approach to healthcare by rectifying the body’s structural problems which restores healthy, natural flow to allow the body to heal itself naturally, thus eliminating the need for hard-core opioid treatments. Over the last 20 years, we have helped thousands of patients in our office with pain in a drug-free, surgery-free manner. On the first visit, we do a thorough examination, x-rays (if needed), a review of our findings, and a spinal adjustment. If you’re in pain, don’t wait to take action. Call us today.